So proclaimed German Philosopher and sociologist, Georg Simmel, to open his 1903 essay, “The Metropolis and Mental Life.”* The social forces of urbanized society can, indeed, be overwhelming in the pressures that they exert for social control, order, and conformity. It is, in fact, difficult to imagine the maintenance of cities—politically, socially, and economically—without some degree of social and legal insistence and exertion of these attributes. But if the City breeds some fear of the loss of individual identity in its potential to enforce social conformity, it also, somewhat paradoxically, possesses the potential for social individuality in the extreme, in the isolation, alienation, and loneliness that sometime afflict its inhabitants. In a real and effective way, the City offers great opportunity for individuality and personal growth. One of the most essential characteristics of cities is the phenomenon of the division of labor and the proliferation of work roles. In the City, the opportunities of persons to capitalize upon various skills and talents, and to seek fulfillment for the variety of personal aspirations and goals man is capable of developing, is greatly widened. In marked contrast, non-urban ways of life are severely limited in role possibilities—farming, fishery, and hunting and gathering being the historically limited and predominant choices. If there has been a singular attraction of the City, it is the opportunity to choose among a wide range of occupations and lifestyles toward personal growth and fulfillment. Yet, these advantages are not gained without some limitations. The diversification of work roles into more specialized forms—an impetus of norms of efficiency—also results in greater degrees of social and economic interdependence and reliance upon various forms of expertise for not only economic activities in general, but the maintenance of many aspects of personal life as well. Moreover, city life, by virtue of the fact that large numbers of diverse persons inhabit and move about its common and relatively confined space, necessitates a degree of subordination of personal interests to the commonweal of the community. Where one may cross a street, what behaviors are permitted in public, and how one may use his property are all subject to public judgment against the public interest. These paradoxical characteristics of urban social life have been reflected or interpreted in various ways in urban art. Although the attributes of the city outlined above have been presented in a generalized way, it is necessary to bear in mind that the paintings of urban artists during and after the Depression, and the impact that it had upon the interpretation of the positive and negative features of urban life, often bear the influence of the times in which they were composed. Moreover, artists, like urbanites in general, are a diverse group in perception, values, philosophies, and ideologies as well as their range of styles and techniques. 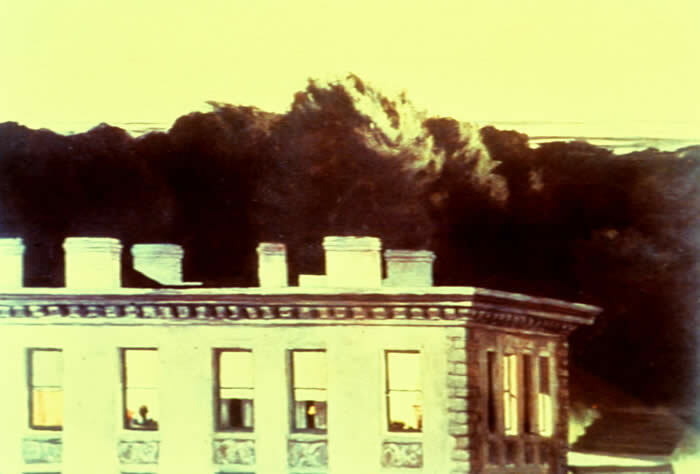 If there is one American urban painter who might be singled out for his attention to the relationship of the individual to the city, it would be Edward Hopper. Born in Nyack, New York, in 1882, Hopper was a contemporary of the early twentieth century urban realists but, like Stuart Davis, he moved in different directions. Unlike Henri and his disciples, he was not, despite two trips to Europe in 1906 and 1910, much influenced stylistically by the Europeans, and unlike “The Eight” he did not perceive the city animated with human activity and dynamism. Yet in spite of finding the American city as “a chaos of ugliness” and as a place where much loneliness prevailed, he chose it as the central theme of his body of work. Hopper took issue with the Regionalists, with whom he is sometimes classified, on the matter of the sources of inspiration and context for the painting of the American scene. This source, he felt, was in the painter himself, rather than the setting, a factor evident in the psychological, moody intimacy of his works. Perhaps one of the more renowned paintings depicting the potential for solitariness in urban life is Hopper’s “Nighthawks” [Fig. 5. 23]. 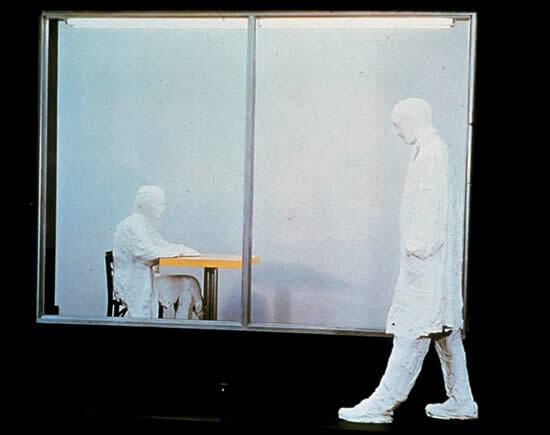 In this somber work, the painter has placed four individuals in seemingly non-communicative postures. The setting was suggested to him by a restaurant on Greenwhich Avenue where two streets meet; however, he simplified the scene considerably in addition to dramatizing the sense of loneliness by enlarging the restaurant itself. 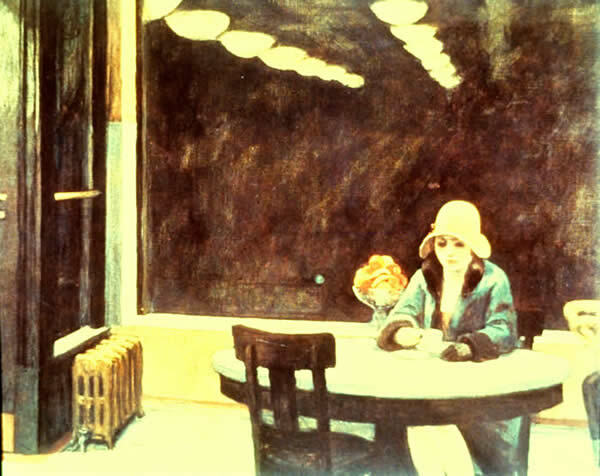 Hopper himself commented that: “Unconsciously, probably, I was painting the loneliness of a large city.” One is also given to suspect that the artist may have unconsciously injected a visual pun upon the title of the painting by portraying one of the diners with angular, hawkish features. The illumination of the restaurant’s interior starkly contrasts with the darkened rooms and vacant shops across the street where, as in several of the painter’s other works, an atmosphere of loneliness is powerfully evoked by the conspicuous absence of people and activity. Hopper’s ability to evoke an atmosphere of mystery combined with the anonymity of the individual in the city appears again in his “House at Dusk,” [Fig. 5. 24] in which a single person is silhouetted in the window of a gray, drab building. Again, there is little sign of activity of human relationship. 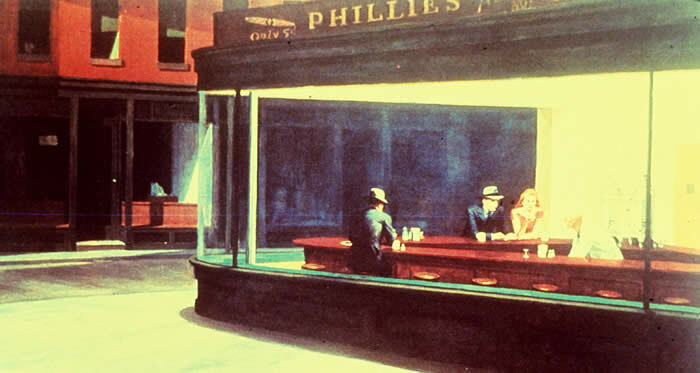 However, as in “Nighthawks,” loneliness and anonymity may appear even more poignantly when it is depicted in settings that are public in character. 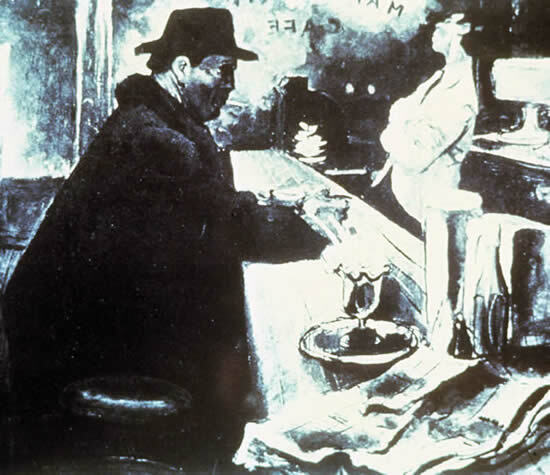 Hopper focuses more closely on this theme in “Automat,” [Fig. 5. 25] a painting in which a woman sits alone with her thoughts over a cup of coffee. That her pensiveness may be of a brooding or melancholy sort is suggested not only by her expression and posture, but, also the dark exterior behind the window that reflects only the rows of the automat’s overhead lights receding into a void. The effect powerfully pulls the viewer’s attention to the internal world of the automat and further into the unknown thoughts of its patron. A similar theme is called forth by William Winter’s “Midnight at Charlie’s” [Fig. 5. 26]. Here again is an anonymous patron of an all-night diner, virtually faceless and with, apparently, no better place to be. The effect is heightened by the uncommunicative attitude of the counterman who, seemingly, prefers staring idly into space to social interaction. It is well understood that the sense of loneliness and alienation is exaggerated at night and, perhaps, it is not accidental that most of the works discussed above revolving around these themes are at night or its onset. T. R. MacDonald’s “1 A.M.” [Fig. 5. 28] evokes these moods in both title and subject. 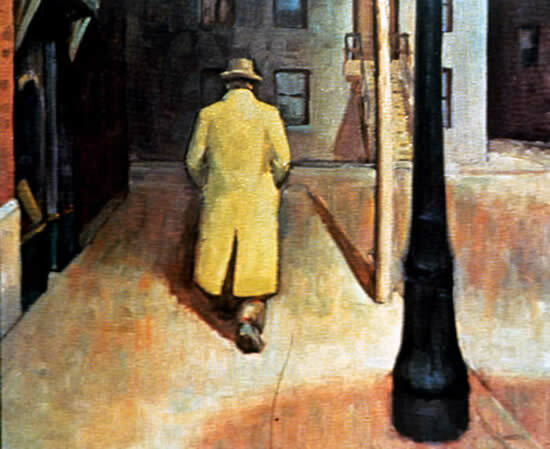 The similarities to Hopper are also evident, depicting a night walker of ambiguous identity and purpose making his way along a nondescript and unembellished street.